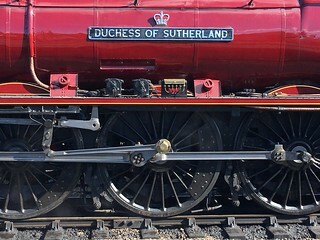 An email informed me that 6233 Duchess of Sutherland would be rolled out of the West Shed at Butterley after a major overhaul and paint job in LMS crimson, on 9 September. 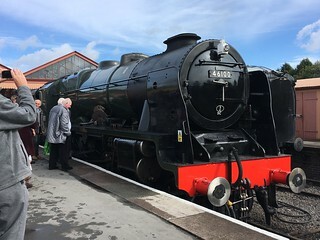 But what caught my eye was that she would be at the Severn Valley Railway 20-23 September for their Autumn Gala (and at the ELR 19-21 October). Further research told me 46100 Royal Scot would also be at the SVR - and 70000 Britannia. So, a trip to the West Midlands was in order. 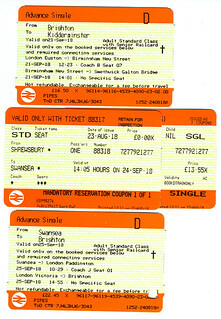 I decided to try a ticket spitting site and got some good prices (scroll to bottom), though I was told had I gone Chiltern Railways from Marylebone it'd be even cheaper. So, despite a cancellation at London Road and a delay on the 12.23 Virgin train to Birmingham New Street, I finally arrived at Kidderminster, via Smethwick Galton Bridge, a station with an elaborate arrangements of platforms! I managed to get a bus into town and checked in at the Premier Inn. The NUJ were boycotting Wetherspoons so I had a wander round: a pint at The Swan near the Town Hall and the man who invented stamps, and another at Ye Olde Seven Stars, a bit further afield. It was a Pokemon community day so it was breakfast at a coffee shop and a wander to capture Chikorita. Three shinies were enough to evolve one of each and so it was off to the station. The first loco I encountered was a surprise: 34027 Taw Valley. 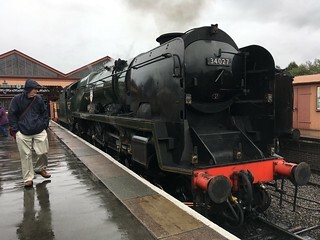 What I discovered about Kidderminster station was that instead of the loco running round and taking the train back, the engine would detach and the loco from the previous train would go on the front, in this case GWR no-namer 2857. This took me to Bridgnorth via the elephants and rhinos of Bewdley, where I missed the return train being pulled by LNER Q6 63395, due to a queue to cross the footbridge. So, got back on the GWR no-namer to Arley where I crossed the line and waited in the rain for the Duchess. 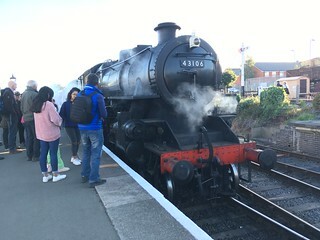 I jumped off at the next station Highley and got an empty 'local' train pulled by GWR 813 back to Arley (Only), where I caught a train back to Kidderminster hauled by 46100 Royal Scot, and what a great noise she made. After a cheeky half of porter in the station forecourt, I went looking for another recommended pub, The Station Inn, the other side of the main line. Then it was a walk back to town via a real find: The Weavers micro pub, my kind of place, where I had a pint of dark mild. Kidderminster has a big bus station but not many buses, and on Sundays hardly any. Google maps told me a 3 bus to Stourport would get me part of the way, but instead of dropping me the other side of the horrible underpass, it carried on for miles before another bus stop, so I stayed on board and exactly an hour later after touring the housing estates of the West MidlandsI was back where I started! Never mind! 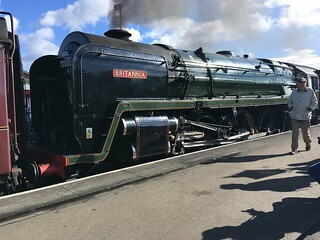 At the station, 46100 Royal Scot was basking in the sunlight, and that GWR no-namer was ready to take the train towards Bridgend. 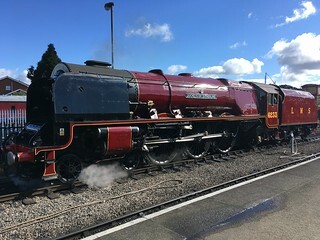 This time I got off at Hampton Loade and caught the Duchess back to Kidderminster, where I hung about until the train was taken out by 70000 Britannia. We now had the best possible view of the Duchess, in a siding, awaiting the next train, which I joined. I went back to Hampton Loade and crossed the line to see if there were any pies left on the platform stall, sadly not, so Headed back to Kidderminster pulled by 43106 'The Flying Pig'. Then it was across the road to the Captain Cod chippy for a fish bite (what fish? ), chips and mushy peas plus cup of tea for a £4.50 deal then along to the The Weavers again, for two pints, and a walk back to the hotel. 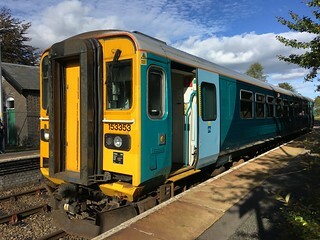 As a bonus I'd decided to ride the Heart Of Wales line from Shrewsbury to Swansea. To get to Shrewsbury I got the 125 to Bridgnorth, then (Google had told me an hour later, but there was one waiting) a 436 to Shrewsbury, where I had 2 hours to kill. Most of these I spent in The Shrewsbury Coffeehouse opposite the gothic station. Eventually our one-carriage train arrived and we began the 4 hour journey through the rolling hills of central Wales. Not nearly as spectacular as the Scottish lines but interesting none the less, with one of the longest announcements ever, what with all the Welsh names as well as the English, many of which were request stops! At Swansea I checked in to the Grand bang opposite the station, and after checking out 4 crap pubs in the vicinity settled for the hotel bar and a couple of pints of Doom Bar. On Tuesday it was back to Brighton via Paddington (my first time there!) and Victoria, where I was grateful for the new lifts, but my journeys always end with those steps at London Road.